It takes many caring hands to fill a little backpack 14” square. These first response foster care bags are just big enough to hold a child’s blanket, small stuffed animal, coloring/activity book, toothbrush, toothpaste, and a note of encouragement. 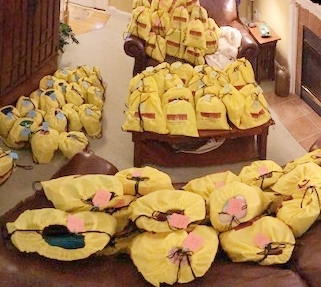 Before these little yellow backpacks with the AGAPE logo on the front can be filled, a call is made, donated items are purchased, a collection area is set up, and arrangements are made to transport. Upon arrival, the items are sorted into bins and gently used items are washed and sometimes mended. Packing day arrives! Fran described her August backpack packing experience this way...what initially looked like an amazing amount of items sorted across two long rows of tables, came to mean so much more after learning how they would be used; maybe a little boy would like a superhero themed backpack or a little girl might like a pretty pink princess themed backpack. Sandi shared how she and her husband were once AGAPE Foster Parents; perhaps their loving example is a reason their son and his family are now fostering through another organization where they live in Arkansas. Sharon appreciated the opportunity to learn more about how the AGAPE ministry touches the lives of children placed in foster care as she worked. While Carolyn feels physically limited in how she can serve these days, she was glad to able to help. Hands help in many other amazing ways. Carolyn also serves with the Raleigh Bear Ministry; both Raleigh and Brooks Ave provide bears. A Quilt Ministry at Deep River creates beautiful quilts and graciously donates several to the AGAPE Backpack Ministry. Sarah is a stay-at-home mom of an active toddler who often feels like her life has been reduced to an unending round of laundry, dishes, and story time. Making comfort blankets for the younger foster children when her schedule allows helps fulfill her desire to serve. Two fall youth rallies hosted by the Cary and Raleigh youth, produced over 150 encouragement cards to slip into the AGAPE backpacks by simply setting up an area for kids to get creative. Geri, the coordinator of this activity at Cary, said several stayed to make cards specifically because the cards were for AGAPE; many already knew about the ministry because their congregation had collected items to go in the backpacks. One girl, about 12, not aware of AGAPE asked Geri about the activity; after learning what it was for, she shared with Geri that she was currently in foster care and intently proceeded to make several cards. Each card was designed with a sense of caring and, while Geri said she struggled with what to say to a young child she did not know, most of the kids had no trouble with what to write. a week which was heartbreaking for her to hear but also solidified her reasons for volunteering. The supervisor shared that many children they place only come with the clothes they have on and how she was blessed to personally witness the happiness these backpacks can bring when she had the opportunity to hand out two herself. And then, we begin again! A spring donation drive is in the works. We tend to run out of blankets when we are packing; winter clearance sales may be a good time to help us stock up! Five Below or thrift stores may be other good resources.